Teaches the guitar and bass parts for 14 songs. Take your guitar playing to the next level as you learn to play hit songs made famous by Clapton, Hendrix, the Who, Santana, SRV and more. Youll learn great licks and new chords, and you'll develop your chops. 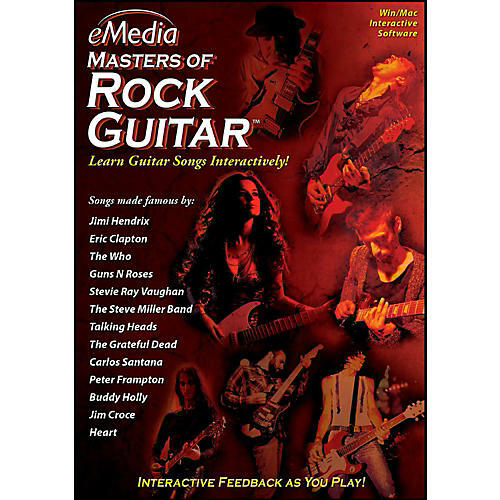 eMedia Masters of Rock Guitar teaches the guitar and bass parts for 14 songs including Behind Blue Eyes (The Who), All Along the Watchtower (Dylan/Hendrix), Oye Como Va (Santana), Before You Accuse Me (Diddley/Clapton), The Sky Is Crying (James/SRV), Baby, I Love Your Way (Frampton), Magic Man (Heart) and more! Tab and standard music notation is made easy to follow thanks to eMedias Interactive Feedback, Animated Fretboard, variable-speed playback and looping. Music tracking highlights notation and lyrics as songs play. The Animated Fretboard shows fingerings synchronized to the music playback and displays even sophisticated techniques like bends, vibrato and slides. Highlight and repeat any section of a song. Slow the music down as needed and gradually speed it up as playing become easier. When youre ready, turn off the guitar part and jam along with the rhythm section! eMedias Interactive Feedback and Performance Evaluation features will help you learn quicker and easier! The software listens through your computers microphone as you play along with the recording and highlights correctly played notes in melodic lines and solos. The notes are highlighted in green, yellow or red depending on whether the correct note, a nearby note or a far off note was recognized. eMedia Masters of Rock Guitar comes with several built-in accessories: an automatic tuner (complete with custom tunings as needed), a recorder (for use with the computer's microphone), and a digital metronome. Artist biographies plus guitar and bass performance notes are included to round out the learning experience. Celebrity performances on eMedia Masters of Rock Guitar include Peter Frampton playing Baby, I Love Your Way and Roger Fisher, former guitarist of Heart, playing a special version of Magic Man. Avoid the wait. Download today.